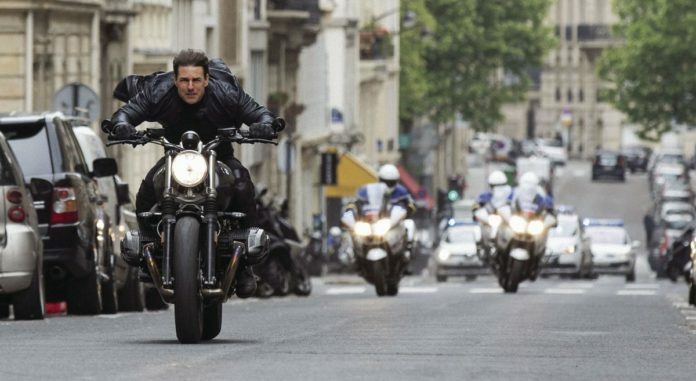 The sixth installment of the stellar Mission: Impossible franchise that began 22 years ago might as well replace the subtitle, Fallout, with The Passion of the Cruise, because our 56-year-old hero is put through the action ringer for more than two thrilling hours, all in the name of faith and trust. Over and over, Tom Cruise tells the screen, “I won’t let you down,” and he never does, because we believe in him to deliver the goods. In the longest film of the franchise, Cruise runs, jumps, scales, climbs, punches, blasts through walls, skydives, hangs off helicopters, and wrestles Superman, each time defying exhaustion through sheer force of will as seen in his eyes. Its a marvel just to watch him endure without collapsing, and through his on-screen suffering he holds us enraptured from start to finish. If anything, Cruise and his film persona, Ethan Hunt, are almost too reliable. As his ex-wife, Julia (Michelle Monaghan) confesses, “I sleep soundly at night knowing you always will be [there].” We know the villain won’t get away with his plan, and the IMF team will come through, and Hunt will triumph just in the nick of time. So why keep watching? n something real, even if its the simulation. With CGI and green screen, de-aging filters and prosthetics and stunt performers filling in during the really dangerous sequences, modern audiences can grow tired of the obvious falsity in action films that constantly require us to suspend our disbelief while a superhero fights a god for control of the universe. When Tom Cruise does his stunts, writer-director Christopher McQuarrie makes sure to focus on his face. How does this make it any more real than if it were a stunt actor jumping from a plane or hanging off a cliff? Both would be in the same circumstances with the same risks. Cruise actually fractured an ankle while free-jumping across the tops of buildings (the footage was left in the film and shows the actor pulling himself onto the ledge and limping away before cutting) which delayed production for months so he could recover. How does this enrich the authenticity of the scene — does his obvious pain cause our sensations to pop like layers of Technicolor used to enhance depth? The outward plot of the sixth film is somewhat rote: There are three plutonium bombs ferried about to the highest bidder and the IMF team needs to get to them before terrorists do. Fine. The real story concerns the management surrounding the team manipulating the concept of the persona to control the direction of Hunt, Luther (Ving Rhames), and Benji (Simon Pegg) by challenging their faith in each other. Ultimately, each player can only control what they represent to others and how expendable or useful they are deemed. The main villain they are chasing is extremist John Lark, which is so plain vanilla as to be a joke on a joke. He might as well be named Archimedes Von Puff-n-Stuff, so the IMF team go after the creators of the joke. McQuarrie is having a delicious blast poking fun at the spy game itself, with persona and disguise, manifestos and foundations of belief. The arms broker is a femme fatale called the White Widow (Vanessa Kirby). Her slimy brother, Zola (Frederick Schmidt), mainly sits in a sports car and pouts while Hunt repeatedly gets away from French thugs wearing blue jeans. Blue jeans! Was I the only one that wondered how they could run in those things? While Hunt may not know exactly who to trust outside his team, he also has operatives watching his back, if only for his value to them. Ilsa (Rebecca Ferguson) is absolutely amazing on a motorcycle and garnered the biggest gasps from the audience when she hits a car and flies over the hood. No one connected to Hunt (or Cruise) is immune from physical disaster and yet, like him, they keep running and running. The biggest surprise is Henry Cavill, whose Agent Walker is brought in by Erica Sloan (Angela Bassett) to lead the mission after Hunt makes an apparent mistake by saving one person before the world. Walker is a Manchurian candidate cut from marble, and the famous Cavillstache — the one that had to be digitally and obviously removed from Superman’s face in Justice League — makes the actor look like a cross between Doc Holliday and a circa-70s pimp, which I endorse completely. Despite his size, Walker’s best scenes are when he is overwhelmed by his diminutive opponent, and Cavill delights in sending up his character as one not to be trusted or underestimated. Whether stalking a mark in a nightclub (a nod to the famous disco scene in “Collateral”) or engaging in a helicopter chase through a narrow mountain pass, Cruise doesn’t just exhibit the screen control we’ve grown accustomed to for decades. He sacrifices the guts for the glory, showing us the process by which he achieves that control within his core, emanating outward through perseverance and commitment to an overall experience. Tom Cruise wants you to enjoy and participate in The Tom Cruise Experience, no holds barred.